The pine family includes the genera fir (Abies), hemlock (Tsuga and Pseudotsuga), spruce (Picea), pine (Pinus), cedar (Cedrus) and larch (Larix and Pseudolarix). 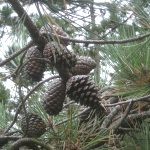 Pines (Pinus) are evergreen and resinous trees, rarely shrubs. 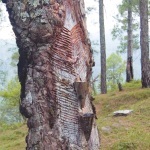 The resin harvested from various species of pine is one of the oldest and most important non-wood products from conifers. Maritime pine (upper three photos) is native to the western Mediterranean area. This pine has been tapped for resin on a large scale, for example in south-western France (Les Landes). Upon distillation the resin yields the so-called French turpentine, used as a solvent for lacquers, artists paints, etc. Today, however, the much cheaper 'mineral turpentine' has replaced it in most applications. French turpentine consists mainly of alpha-pinene and beta-pinene together with smaller amounts of other terpenes and sesquiterpenes . The residue from distillation, called rosin or colophony, is primarily composed of abietic acid. It is used, for example, as a friction-increasing agent in violin/viola/cello rosin. When the resinous bark of maritime pine is warmed by the sun it develops a fine musky-sweet nuance. As shown by the prominent fragrance chemist Roman Kaiser, a number of macrolides are indeed present as trace components in the bark headspace, two of them, tetradecane-13-olide and hexadecane-15-olide, are depicted above . 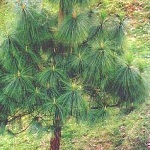 Long-leaved pine (lower two photos) is a large pine native to the Himalayas with long slender needles (20-35 cm). 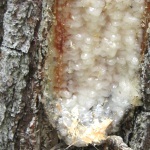 It is tapped commercially for resin which on distillation yields the so-called Indian turpentine, rich in the sesquiterpene longifolene (about 30 %). This compound was isolated already in 1920 but its structure remained a mystery for over 30 years because chemical degradation gave complex mixtures of highly rearranged products . Longifolene is the source of a number of derivates being valued in perfumery for their woody, ambra-like odors. One of them, isolongifolanone, obtained via acid-catalysed rearrangement of longifolene to isolongifolene and subsequent oxidation, is marketed by Givaudan. It has a fresh, dry and diffusive woody note with a rich ambra-like quality. Etymology: The word turpentine derives from the ancient Greek 'terebinthos', a name for a pistachio, Pistacia terebinthus, of the Mediterranean macchia vegetation, from which the so-called Chios turpentine was obtained. Later on, the name turpentine came in use for volatile oils from conifers. From here origins the organic chemistry name terpene, denoting an isoprene-derived hydrocarbon (C10). 'Mineral turpentine', on the other hand, is a mineral oil product consisting of a mixture of aliphatic and aromatic hydrocarbons with a similar boiling point interval and similar solvent properties as French turpentine. Lat. roxburghii, from William Roxburgh (1751-1815), a Scottish physician and botanist, who has been called the father of Indian botany. P.S. 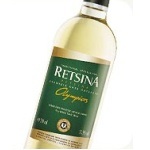 The traditional Greek retsina is white wine with resin from aleppo pine, P. halepensis, added to the must at the start of fermentation. It is said that the best resin comes from the Attica region, near Athens. To this author, the special resinous (camphoraceous) aroma of retsina makes a vivid demonstration of the difference between nasal and retro-nasal aroma perception. The monocot pineapple family, Bromeliaceae, counts about 1700 species, the majority of which is living as epiphytes in trees. 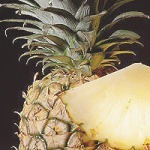 Pineapple, however, grows on the ground as a stem-less rosette plant with stiff, thorny leaves. 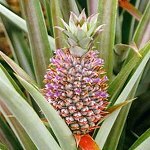 Pineapple is a native of the northern parts of South America and was cultured long before Columbus saw it in Guadaloupe in 1493. The small flowers are surrounded by violet leaves (picture in the middle). 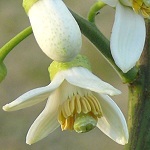 On ripening, not only the ovaries of the flowers become juicy, but also the flower stem. It all fuses together to become what we call a pineapple fruit (or ananas fruit). The cultured varieties are without seeds. Hawaii is one of the major exporters. A truly ripe pineapple is a delicacy. 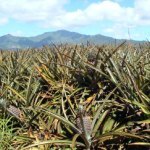 A recent study identified more than 130 aroma compounds in the juice from freshly cut pineapples, with methyl 2-methylbutanoate, methyl 3-(methylthio)-propanoate, furaneol and mesifurane as the major constituents . Etymology: The Tupi Indians called the fruit nana. The English word pineapple, and the Spanish word pinos, reflects the fruit's resemblance with a (large) cone from a pine. 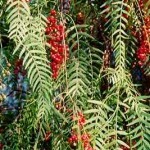 Peruvian pepper tree, an Anacardiacean tree reaching a height of 15 m, is growing wild from Mexico to Southern Chile. It is not related to black pepper, but the dried, red, berry-like fruits are used in a similar way as a spice. The essential oil of 'pink pepper' has a sweeter character, going well even in fruit sauces, vinaigrettes, and desserts. 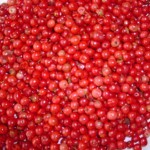 The berries are also used to prepare a traditional Peruvian alcoholic drink. Pink pepper oil is dominated by monterpenes and sesquiterpenes, with alpha-cadinol as one of the major oxygenated compounds . The oil has a very fresh odor reminiscent of the top notes of black pepper oil and has found a little use in perfumery as it brings diffusivity, adds a creamy aspect, and blends well with musks. It is used, for example, in Pleasures (E. Lauder 1995) . 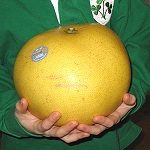 Pomelo is the largest of all citrus fruits. The pomelo tree, reaching a height of 6 to 13 m, probably origins in Malaysia and Thailand. There are several cultivars, some have fruits weighing nearly 10 kg! The Chinese "Honey Pomelo" has recently become very popular in Denmark. It has a mild and sweet taste. The membranes enveloping the loose juice vesicles are bitter from the flavone glycoside naringin (upper left structure) but they are easily removed. 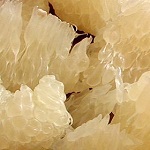 Pomelo is considered to be the ancestor of grapefruit (through a crossing with sweet orange) and they both have the characteristic green-woody smell from nootkatone (lower right structure) in their peel oil . The pomelo flowers are fragrant and described as having a jasmine- and neroli-like scent. In northern Vietnam they are gathered for making perfume. Etymology: nootkatone, this sesquiterpene ketone was first isolated from nootka cypress, Callitropsis nootkatensis, named from the Nootka Indians of the Pacific northwest coast of Canada . The genus Ligustrum of the olive family holds around 50 species, most of them from eastern Asia. They are evergreen or semi-evergreen bushes or small trees. Many are used as hedge plants. 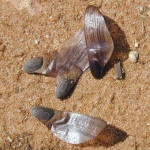 The only European species is L. vulgare (left photo). Oval-leaved privet from Japan, L. ovalifolium, however, is now more popular for hedging because it keeps its leaves better in winter (right photo). The creamy-white flowers of European privet are produced in mid-summer and have a characteristic sweetish scent with a sharp nuance - slightly reminiscent of latex (vulcanized) to this author. 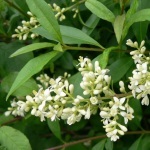 Daniel Joulain at Research Labortories, Robertet S.A., investigated the headspace of privet flowers and found that two of the major ingredients are veratrole (14 %) with a creamy, slightly vanilla-like odor, and phenylacetaldehyde (17 %) with a sharp green character. 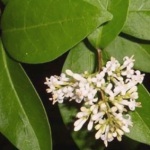 The flowers of oval-leaved privet smell slightly different, phenylacetaldehyde is absent and, in addition to veratrole (4 %), methyl o-anisate (5%) and phloroglucinol trimethyl ether (1 %) are present. Both species also emit linalool (8 % and 5 % respectively) and phenylbutanones, and oval-leaved privet also hotrieneol (0.5 %) . Etymology: privet or private, because of their extensive use for privacy hedging. 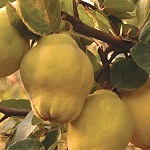 Quince (Marmelo) is a small tree native of southwestern Asia and the Caucasus area. 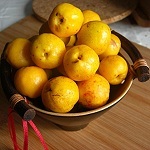 Close relatives are the Chinese quince, Pseudocydonia sinensis, and the ornamental Japanese quince of genus Chaenomeles. Pear (Pyrus) is a more distant relative. The unripe quince fruit is green and hairy (pubescent), the ripe fruit is yellow and has a somewhat greasy skin with a distinct aroma. The flesh is hard, acidic, astringent from tannins and non-edible raw, but once cooked and sweetened it turns red and becomes a true delicacy with a pronounced flavor. 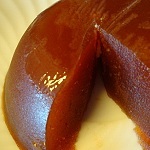 A quince jelly i shown. 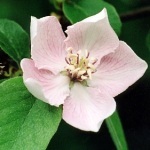 Although depending on cultivar, the prominent scent from the skin of ripe quince is mostly dominated by aliphatic esters. A recent study found ethyl octanoate to be the most abundant compound followed by ethyl hexanoate . However, a multitude of minor volatiles accompany these simple esters and combine to the rich and tempting aroma. Important are a series of C10-constituents of irregular isoprenoid structure, especially marmelo lactone and marmelo oxide . 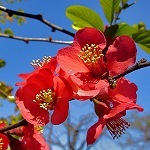 The flavor development during cooking of quince is due to further liberation and transformation of aroma compounds from carotenoid glycosides in the flesh. Theaspiranes, for example, make a contribution . The popular red-flowering garden ornamentals Chaenomeles japonica and C. speciosa (both are called Japanese quince) are bushes with smaller fruits becoming more orange upon ripening and developing a somewhat heavier scent than those of Cydonia oblonga. In addition to aliphatic esters, edulan I, ethyl (Z)-4-decenoate, ethyl anisate and a multitude of other constituents are present , probably also marmelo lactone and marmelo oxide. Chaenomeles flowers and fruits are shown in the last two photos. Etymology: Gr. Kydonia, a town on Crete, i.e. Cydonian apple. The term marmalade, originally meaning a quince jam, derives from marmelo, the Portuguese word for this fruit. Quisqualis indica is a ligneous wine growing to a height of 8 metres with tubular fragrant flowers. 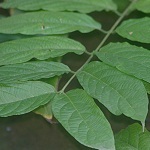 It is probably native to south-eastern Asia but is now found in many tropical areas. The Botanic Garden in Copenhagen has a single large specimen growing in the tropical greenhouse. In full bloom the flowers fill the whole greenhouse with their powerful, heavy, overripe peach-apricot-like and slightly jasminic-animal odor! Rout et al. identified the major components in subcritical CO2-extract of the flowers to be the linalool oxides (furanoid and pyranoid), 2,2,6-trimethyl-6-vinyl-3-oxo-tetrahydropyran, (E,E)-alpha-farnesene, (Z)-3-hexenyl benzoate and benzyl benzoate . Etymology: The German-born naturalist Rumphius, who studied the flora of Ambon in the 17'th century, was so amazed by the variability of this climbing shrub that he gave it the name Quisqualis, i.e. 'what kind'! Not only are the flowers white when they come out and then slowly change into a bloody red during the next day - so that flowers on the same shaft may have different colours  - but the leaves are also arranged in different patterns. Linné adopted the name by Rumphius for this genus. P.S. The narrow-winged fruits have a single tasty seed. Eating more than a few, however, makes you fall into a deep sleep! The seeds contain a 1,2,4-oxadiazolidin-3,5-dione derivative called quisqualic acid. Being an isostere of glutamic acid and a potent gutamic acid receptor agonist it has interesting physiological effects now under intense study . 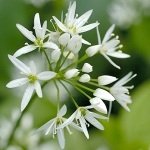 Ramsons have broad long-stemmed leaves and beautiful white flowers in umbels. They grow in rich and moist deciduous woodlands in temperate zones, often near the coastline. They are capable of wiping out all other herbs where they grow, forming dense stands. The whole plant is edible. The first evidence of the human use of ramsons comes from the mesolithic settlement of Barkaer (Denmark) where an impression of a leaf has been found. Ramsons' leaves taste midway between garlic and leek with a grassy nuance. Where ramsons abound the air may be filled with their powerful garlic-like smell. Puxbaum and König detected the above organic sulfur compounds in the atmosphere of a beech forest near Vienna with a ground cover of ramsons. The atmospheric emission rate of organic sulfur species from A. ursinum determined with an enclosure box was the highest ever reported for terrestrial continental plants . Etymology: Lat. 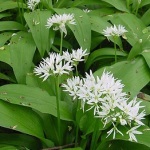 ursinum, from ursus, the brown bear, which has a taste for the bulbs. The same is true of the wild boar. 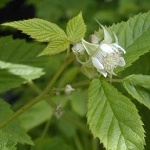 Raspberry forms dense stands in the woods on clearings and along paths where the ground is rich in nitrogen nutrients. 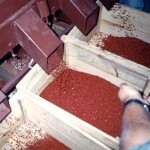 It spreads rapidly by rood suckers, and the birds help its propagation by eating the berries, whose seeds pass the birds' gut without loosing their germination capacity. Many heavily bearing sorts with berries larger than those of the wild type are developed, but most often their aroma is somewhat fainter. The aroma of raspberry is highly characterized by the phenolic ketone 1-(4-hydroxyphenyl)-3-butanone in harmony with ionones, beta-damascenone and mesifurane. 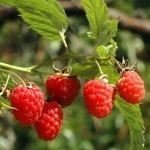 Altogether more than 200 compounds are identified in the aroma of raspberry. 1-(4-Hydroxyphenyl)-3-butanone is also called raspberry ketone. In its pure state it is a colourless, crystalline substance (mp. 82 ºC) with an intense, warm and penetrating character, reminding of raspberry preserve. Alpha-ionone in raspberry is the pure (R)-(+)-(E)-enantiomer and may therefore be used as a marker in checking for artificial raspberry aroma . Etymology: Lat. Rubus, the old Latin name for blackberry, Lat. idaeus, growing on wooded mountain slopes.